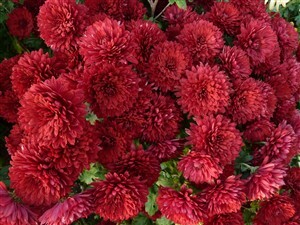 Chrysanthemum 'Ruby Mound' (Kor) A much sought after Chrysanth. (especially recently when it featured in a major magazine article and I sold out!) Many rich ruby red double flowers a truly arresting sight. Sheltered position, not unimproved soil.